Cobblers defender Aaron Pierre wore the captain’s armband for Grenada as they won 2-0 over Puerto Rico in the last round of CONCACAF Nations League qualification on Sunday night. 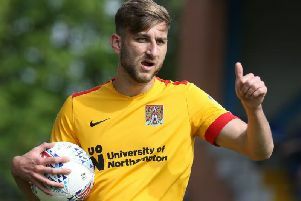 Pierre, winning only his sixth cap for his country, played the full 90 minutes as former Northampton loanee Antonio German pounced on a disastrous goalkeeping error to net a first-half opener before Arthur Paterson’s fine finish doubled the lead 16 minutes from full-time. However, the win was not enough for Grenada to qualify for this summer’s tournament. Elsewhere, Cobblers midfielder Timi Elsnik, on loan from Derby County, made his Slovenia U21s debut at the weekend when they were beaten 3-0 by Georgia.